it’s probably time we all agree that leopard is one of the best prints of all time, because i’m officially calling it the pattern of the season. in case you haven’t noticed, leopard is absolutely everywhere this fall, making me one happy gal. SINCE buying MY FIRST PAIR OF leopard ballet FLATS way back in high school, I’ve passionately believed that every wardrobe should include AT LEAST something leopard. and why not? it’s a statement on its own, easy to mix, and insanely versatilE. lately i’ve been eyeing leopard coats and head to toe leopard (a big fan of the matchy-matchy look), so i’ve rounded 9 great outfits featuring fall’s pattern darling. my takeaway? the more leo the better! hi there! we finally got a preview of spring this friday (including 65 degree, sunny weather! ), and i've started getting excited for a new season -- that means easy fabrics, colorful patterns, and shoes that are not boots! it's been a while since the last "collection with" post, so when i saw norvis' fall ready to wear for 2018 i knew it was worth sharing. this collection was designed for fall but the bright colors, breezy silhouettes and florals makes this feel perfect for spring. my favorite look is definitely the floral gown -- it's positively striking, and i wish i had a garden party i could wear this to. who knew tulle and a chunky grandpa knit would go so great together. i also love the playful scallop d'orsay pumps -- a shoe didn't know i needed in my life until now. i lovvvvve this look. the scarf is enormous, almost comically so, but it looks so cool with a structured plaid dress and undone ankle tie flats. there are a few recurring patterns in norvis' collection, including plaid, polka dots and florals. my favorite print is this yellow floral -- it's so versatile! happy Monday! i am lucky enough to have today off (happy president's day! ), and am planning on spending it doing things i normally couldn't do during the week. like spend my morning blogging in the parlor, or going on a midday walk with foxy around the neighborhood. the possibilities feel endless! since nyfw just ended, i thought it was time to do another "the collection with..." story. this is Rochas Pre-Fall 2017 collection, and it has a lot of great moments: the colors (yellows, blush, peacock blue, and elephant gray), ankle-strap platforms with thick socks, snakeskin, fuzzy coats, golden brocade layered with preppy turtlenecks, delicate florals, velvet, monograms and imperfect hair. i was drawn to this collection partly because of the presentation. these photos are full of movement, capturing those awkward, but wonderful in between moments. an unexpected pairing with proper, aristocratic garb. let's face it, for 2017 muppet fuzz is in -- whether it be a sandal covered in fluffy pom poms, or the warmest jacket you own. it's bright, bold and colorful. Rochas collection includes a faux fur coat in mustard gold and blush pink (keep on scrolling to see that one). florals and animal prints are a classic pattern mixing combination. in this instance, it's gray snakeskin and granny roses. below is the amazing snakeskin trench coat that inspired me to share this collection in the first place. i'm officially convinced that every girl needs a statement trench in their closet, and a trench made out of this snakeskin pattern feels unexpected but timeless. this is the blush faux fur coat, layered to perfection with velvet, brocade and chunky socks. the red snakeskin used in Rochas' collection is truly beautiful. in my opinion, colored snakeskin can run a fine line between impossibly chic and tacky, especially if it's red. but here, it totally works. i especially love how this skirt has been styled -- paired with an effortless rose colored tank, and luxe velvet pumps. the J.Crew Fall RTW Collection for 2016 is pretty great -- classic menswear-inspired pieces, perfectly causal shapes, and really fun styling. the collection comes in a weirdly sophisticated mixture of bright magenta, oxblood, blush, bubble gum pink, pastel blue, cool grays, caramel, navy, taxi cab yellow, and green. did i miss any? there also is a parka with a pink fur trimmed parka. the shooooes make me happy: loafers, lace-up flats, and a pointy toe snakeskin pair (see below) that i'm practically in love with. the patterns and pattern mixing though....(!). snakeskin, argyle, leopard, geometric lines, stripes, houndstooth, and a bunch of different florals. an abstract floral print on a black background: you really can wear florals in fall and winter. then, pair it with stripes. i think this is such a fun look: a scarf, belt, FOUR different patterns and pastel pants. then throw on a bubblegum pink (and widely coveted) faux fur jacket for good measure. phew. it's so wacky it works. a cool clash of leopard and Lilly Pulitzer-inspired florals. so into the shape of this leopard coat. mixing print neutrals: florals, stripes and leopard (lace up flats? heels? i want/need a pair either way). this makes me want to try mixing two animal prints, like leopard with snakeskin. even though fall pretty much just ended, i had to talk about Sonia Rykiel's Pre-Fall 2016 collection. so much refreshing inspiration. i love the mix of traditional fall colors (brown, olive, gold) with mint, bright red and a bold statement print. oh, and exaggerated fur accessories. with a description like that, this collection seems like it would be loud and intimidating to wear. but each look is made up of simple shapes -- an oversized blazer and skinny pant, for example -- making it not only covetable, but totally wearable. i am especially obsessed with the hand pattern. the crop top blouse + skinny pant combo is my favorite. hands down..(har-har). those are not polka dots -- they're actually enamel hand pins (or buttons, i am not too sure). go on, zoom in and take a look. the details are so good! glamorous but ridiculously effortless. cute to wear to a winter wedding. leopard + print mixing: two ways. this collection makes me so happy. the southwestern inspiration! the candy-colored stripes! the cactus blazer! all in impossibly cool-girl shapes. it's just so good. i stumbled upon Mira Mikati while putting together my Emoji Fever post, and couldn't get this fun collection off my mind. 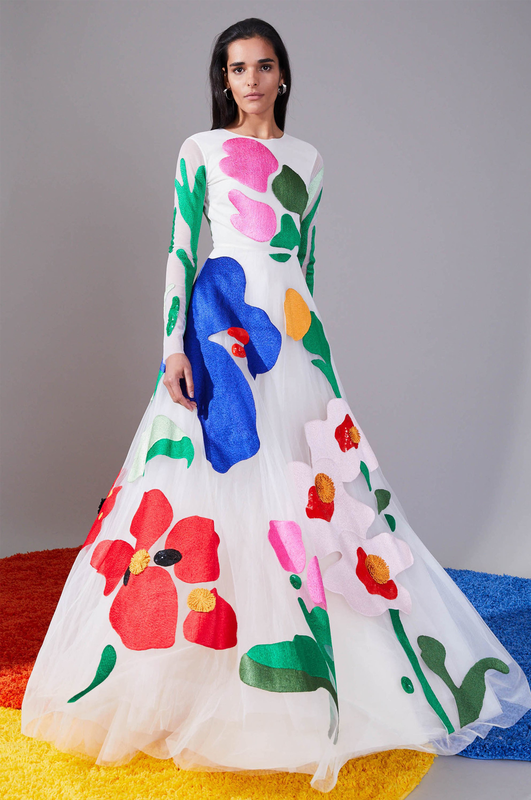 a relatively new designer, Mira Mikati set off on on her own in 2012. her pieces are clearly tongue-and-cheek and have a sense of humor. aka she makes the idea of throwing on a coat covered in emojis sound the the right thing to do. (which it is btw). this is her second collection. candy colored maxi dress with shower shoes. i especially love the pattern itself: solid stripes mixed with multicolored stripes. i love that this fabric looks like it was pulled out of my childhood coloring book. also cute nail color. a effortless shape, and beautiful bold green. plus shower shoes.